Harry T. Hays (1820-76), Major General, CSA. Participated at 1st Manassas, 1862 Shenandoah Valley Campaign (WIA), Sharpsburg, Fredericksburg, Chancellorsville, Gettysburg, Wilderness, Spotsylvania (WIA), and the Trans-Mississippi Department. Manuscript Document Signed with rank as Brig. Genl. Comdg., 2 pages, 4to., "Head Quarters Hays Brigade Jany 29, 1863" pertaining to soldiers of the 5th, 6th, 7th, & 8th Louisiana Infantry, who were detailed to hospitals. 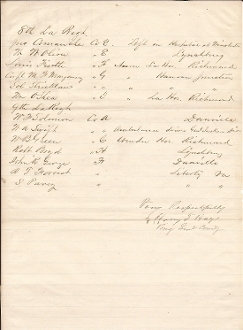 Listing 37 by name, occupation, and which regiment and company they are from and to which hospital they are assigned. Very Fine. Rare autograph & document.